Who would you name as the happiest person you’ve ever met? Neuroscientists say that it’s a 66-year-old former genetic scientist and French intellectual named Matthieu Ricard. He’s on one level an unlikely candidate for this title, being the son of a father who is a philosopher and a mother who is an artist, neither profession generally regarded in France as shining examples of joy and happiness. But Ricard turned his back 40 years ago on Parisian intellectual life and the day-to-day grind of traditional science and instead devoted himself to what he calls “the science of happiness.” He became a Tibetan Buddhist monk, and learned to meditate. The research conducted on Matthieu Ricard was part of a larger study on neuroplasticity, the seeming ability of the human brain to remap and reinvent itself as the result of meditation and techniques generally referred to as mindfulness techniques. 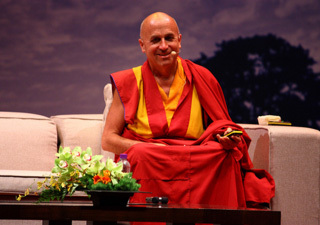 Ricard has certainly practiced such techniques for many years, becoming a prominent figure in the community of Tibetan Buddhism, and a close advisor to and translator for the Dalai Lama on his speaking tours around the world. He is also an author, having written a famous dialogue with his philosopher father called The Monk and the Philosopher, and a practical guide to the meditative arts called The Art of Meditation. Both became bestsellers. Much of Ricard’s life these days revolves around meditation and the spreading of it, and his work with the Dalai Lama, but his background as a scientist led him to participate in the ongoing studies on neuroplasticity. He feels – as do the scientists who are still in awe of his brain’s ability to feel and experience joy and happiness – that scientific research will help to inspire others to give meditation a try, and thus experience more joy and happiness themselves. And that seems to be happening. In the last few years, secular techniques based on traditional Tibetan Buddhist mindfulness practices have been shown to reduce loneliness and anxiety, and have been used in numerous hospitals to treat depression, chronic pain, and post-traumatic stress disorder. More recent studies have shown that these techniques also increase people’s ability to feel empathy, and thus relate in more positive ways with others. If you are interested in hearing some of Matthieu Ricard’s insights into meditation and the science of happiness, there is a free video of him speaking on these subjects here. While I do not for a moment disagree with what Matthieu Ricard says about the value of meditation, and how it has expanded his ability to feel joy, I want to add my personal “take” or opinion on the subject. I’ve written in the past on this forum about neuroplasticity, and how the most important “rule” for keeping our brains healthy and growing seems to be “Use it or lose it.” The more we exercise our brains, the larger and healthier they seem to become. I bring this up because I’ve actually seen Matthieu Ricard a couple of times in person, translating for the Dalai Lama. I am not exaggerating when I say that on both occasions I witnessed what I believe to be the most prodigious feats of concentration and mental acuity I have ever encountered in my life. Those of you who have never seen Tibetan teachers and how they work with translators may not understand what I’m talking about, so I will explain. The position of translator to an important Tibetan teacher is considered not only a position of honor, but a form of teaching or meditation in itself. The reason is that the translation is not done the way you’ve seen it done elsewhere, say at the United Nations. Instead of the teacher speaking one or two sentences and then pausing while they are translated before speaking the next sentence, when Mssr. Ricard is translating for the Dalai Lama, he allows his teacher to talk as long as he wants. While the teacher is talking, Mssr. Ricard sits there beside him quietly, taking no notes. The teacher may speak for only a minute or so, or for five minutes or longer if he really gets into some subject. When the teacher finally pauses, then and only then does the translator begin to repeat what the teacher said. This is a feat I have never seen equaled. No matter how long the teacher has spoken, Matthieu Ricard repeats every word he said, leaving nothing out, and adding nothing. Both times I saw him translate for the Dalai Lama, I was sitting with someone bilingual in both Tibetan and the language being translated into, and they confirmed that Ricard had done it flawlessly. Not only had he remembered every word, he did so while internally translating those words into another language. While my own experience practicing meditation leads me to believe that, as Matthieu Ricard says, it has the ability to completely change your brain, I know that I would not be able to do what he does. Could you? Could anyone you’ve ever met? If, as the neuroscientists believe, Ricard has the largest capacity for joy or happiness they’ve ever encountered, I have to believe that at least part of the credit for this is due to continually stretching his mind while translating in this way, and thus forcing his brain to constantly “work out” and expand. His brain has a bigger capacity for joy because his brain has a bigger capacity, period. But Ricard would be the first to point out that this is not because he is in any way “special” or was “born that way,” as some kind of prodigy. He worked at becoming the happiest man in the world, practicing the forms of meditation that made that possible. So can we.